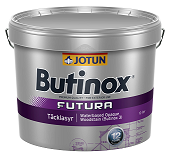 The Manufacturer of Butinox (Jotun Paints) have replaced this product with their Higher quality Jotun "Demidekk Ultimate" brand which offers up to 12 years between repaints rather than 8 years with the current Butinox No3 and its available in the same colours. BUTINOX futura Opaque Satin The special alkyd oil/acrylic binder combination provides a highly flexible coating, allowing the natural movements (expansion and contraction) of the wood. High performance Opaque Satin finish, gives extended life may be applied over suitable, sound conventional paint systems.